Where Chianti become "Black Rooster"
The renowned battles between Siena and Florence crossed Fonterutoli, a small medieval hamlet straddled between the two provinces, in the municipality of Castellina in Chianti. In 1201 an agreement was signed here between the two towns to put an end to the fights that had been parting them for decades. According to the agreement, Siena was free to conquer Montalcino, while Florence would aim to Semifonte. And so it was, and in 1208 the hamlet also hosted the signing of a new peace treaty between the rival municipalities. The end of the hostilities among Siena and Florence in Fonterutoli created also its special legend. The story goes that two knights, one from Siena and the other from Florence, challenged each other to solve once and for all the dispute for the control over the Chianti area: at cockcrow, the two knights were supposed to gallop from their respective towns and the place of their meeting would mark the new border. The Florentines played it clever and neglected feeding the rooster the night before; the latter woke up hungry and crowed before day break, thus allowing the Florentine knight to leave before the Sienese one. That's why the Sienese border only reached up to Fonterutoli and the black rooster became the symbol of the Chianti League. Nowadays, the hamlet of Fonterutoli, located along the ancient Chiantigiana Roman road, still shows several traces of its Medieval past, and is well worth a visit, both for the historical battles fought between Siena and Florence. Chianti, the area in which Chianti Classico wine has been produced for centuries, is that part of Tuscany that is bordered to the north by the suburbs of Florence, to the east by the Chianti Mountains, to the south by the city of Siena and to the west by the valleys of the Pesa and Elsa rivers. The area is traversed by the Superhighway of the Palio. It is a land of ancient traditions that was civilized in remote periods first by the Etruscans, who left many traces of their activity in the wine sector, and then by the Romans. In the Middle Ages, the cities of Florence and Siena battled for control over the zone. Villages and monasteries, castles and fortresses appeared during that period and many of them were later transformed into villas and country residences when times were more tranquil. It was then that spaces were cleared in the vast forests of chestnuts and oaks for the cultivation of vines and olive trees, an activity that progressively assumed major economic importance and established an international reputation. The first notarial document in which the name Chianti appeared in reference to the wine produced in the zone dates to 1398 and in the 17th century exports to England became increasingly frequent. With the agrarian revival in Tuscany in the early 18th century, the sharecropper system came to dominate Chianti and the landscape was enriched because of the different way in which work was organized. Many of the farmhouses, as well as the physical layout of the properties, which has survived, date to that period. From the end of the 19th century to the threshold of the third millennium, Chianti Classico wine has steadily reinforced its position in the affections of wine lovers throughout the world and thereby assured the prosperity and well-being of the region. Siena and Florence are the capitals of Chianti, which is shared between the provinces of the two communities. The zone amounts to 70,000 hectares (172,900 acres) and includes the entire territories of the communes of Castellina in Chianti, Gaiole in Chianti, Greve in Chianti and Radda in Chianti and parts of those of Barberino Val d'Elsa, Castelnuovo Berardenga, Poggibonsi, San Casciano Val di Pesa and Tavarnelle Val di Pesa. Forests occupy almost two-thirds of the zone. Oaks grow just about everywhere, while chestnuts thrive primarily on the eastern side of the district. Conifers are concentrated at higher altitudes, while stands of pines are common on the low hills to the south of Florence. Wild animals are not as numerous as they once were but it is still possible to observe pheasants, wild boar, hares and roebucks in the zone. The Chianti wine-producing area was delimited in 1932 by ministerial decree and the boundaries have remained unchanged since then. 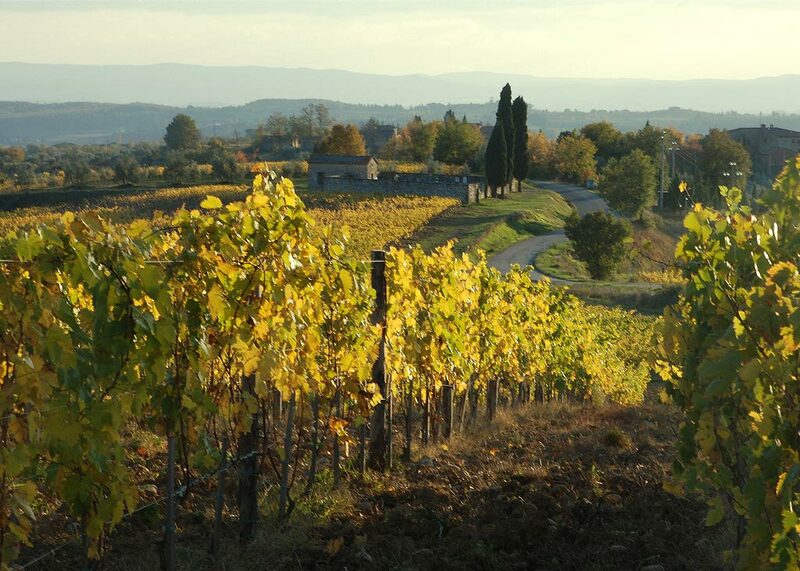 The decree described the district where Chianti Classico is produced as the "the oldest zone of origin," thereby recognizing its primacy and according it a special identity. Not all the wine produced in the Chianti zone is Chianti Classico. To have the right to a denomination is not sufficient. In fact, the provenance refers to a given territory but also all the rules stipulated in the production regulations must be respected. Those rules determine the conditions and the requisites that permit a wine to be decked out with the name Chianti Classico DOCG. Chianti Classico wine In addition, other fundamentals and other requisites concern the ampelographical base�or the types of grapes that can be used in the preparation of the wine. The rules provide for a minimum ratio of 80% for Sangiovese, the typical red variety of the zone. Along with the Sangiovese, other red grapes of the area can be used in a maximum percentage of 20%. These grapes include natives like Canaiolo and Colorino as well as "international" varieties like Cabernet Sauvignon and Merlot, all recommended and/or authorized for the production zone. Among the principal sensory characteristics indicated by the production rules, there is the ruby red color that can become at times intense and profound, depending upon the wine's origin. The odor offers floral notes of violets and irises combined with a typical character of red fruit. The flavor is harmonious, dry and sapid with a good level of tannin that fines in time, becoming soft and velvety. Other requisites requested include a minimum alcohol level of 12 degrees for young wines and 12.5 degrees for the Riserva. Minimum net dry extract amounts to 24 g/l, while total minimum acidity is registered at 4.5 g/l. In addition, the production rules require important factors. For example, it is stipulated that the yield of grapes per hectare cannot exceed 75 quintals four years after the vines are planted and that the yield of wine from grapes cannot exceed 70% or 52.5 hectoliters per hectare. In addition, the regulations note that the processes of vinification, preservation and bottling must occur exclusively in the production zone. And the wine may not be released for consumption before October 1. Minimum required maturation for the Riserva is 24 months including three months of bottle fining. As far as the label is concerned, the regulations contain some terms that are added to those already stipulated by the specific rules in effect in the sector. In the first place, the label must contain the indication "Chianti Classico" with the more specific identification, Denominazione di Origine Controllata e Garantita and display the year when the grapes were produced (vintage). The name of the wine can be identified in connection with that of the estate or with a brand name or it can be a fantasy name or indication of the name of the vineyard of provenance. In any case, terms like extra, fine, select, selected, superiore, old and similar may not be used. The minimum permitted ratio of Sangiovese grapes used in the production of the wine is 80%, a percentage that can rise to 100%. Sangiovese is the real soul of Chianti Classico. The Sangiovese grape is extremely sensitive to external factors, especially terrain and climate, and it is truly difficult to identify another variety that is so well able to interpret the characteristics of the soil and modify its aromas in accordance with the terrain in which the vine grows. Flowery bouquets are derived from sandy soils, while scents of wild berries are suggested by limestone and the aromas of tobacco are fresh with hints of tufa. But always, whatever may be its zone of origin, there is that scent of violets that the production regulations identify as the characterizing and specific element of Chianti Classico. In the first years of its life, Chianti Classico is odorous, fruity and rounded and the wine features a brilliant ruby red color. But Sangiovese is a grape of medium-long aging capacity and it is used in extremely high percentages or alone as is foreseen for Chianti Classico. This can result in products with big bodies and substantial complexity that can withstand many years of aging. Of the entire production of Chianti Classico, about 20% is now devoted to Riservas, wines with dark red colors tending to garnet and aromas of spices and wild berries. They also offer imposing structures and are elegant and velvety. The best grapes are selected at the time of the harvest for the production of Riservas. Their qualities are further enriched when they are exposed to wood during maturation. Huge casks of chestnut and oak were once used but today producers prefer containers of oak with smaller dimensions, which accelerate the evolutionary processes and permit greater transference of their aromas to the wines. The wine matures in the wood for a more or less prolonged period, depending upon the dimensions of the container. There is, then, a further pause for bottle fining before the wine is sent to the market. The traditional training systems include Guyot and a derivation known as the archetto toscano (Tuscan bow). In recent years, especially in new vineyards, the spurred cordon system has become widely diffused, possibly because it offers outstanding prospects for mechanization that still assures high-quality production. If the system of cultivation selected is traditional, the terrain will be worked many times during the year. Currently, however, growers are encouraging the growth of grasses among the vines and especially on relatively steep slopes. This permits draining of excess water and reduction of erosion. The revival of the vine's vegetation after the cold weather of winter begins with the opening of the buds from which the shoots will emerge. This occurs about the middle of April. Toward the end of May and the beginning of June the vines produce small, odorous white flowers. Setting occurs in mid-June. This is the point at which flower becomes fruit. With the heat of July and the early days of August, the small grapes, initially green, begin to change color progressively in a process known as veraison. At that point, ripening begins and during it the grapes take on various substances that will ensure production of fine wines. Those substances include sugars, polyphenols and aromas. Meanwhile, the level of acidity shrinks to desirable levels. September is perhaps the most important and delicate month for ripening. The variations in temperatures between the sunny days and the cool evenings assure completion of a lengthy process. October is the month of the harvest, which occurs at different times depending upon the type of grape and the fruit's maturation. In zones at lower altitudes, harvesting can begin at the end of September, while ripening is slower at higher altitudes. From the end of November to the end of February, the vines are dormant and it is now time for pruning. As soon as they arrive in the winery the grapes are subjected to crushing and the removal of their stalks. The must obtained is then transferred to various types of containers where alcoholic fermentation begins. It is characterized initially by a tumultuous phase with the development of temperatures that are generally below 30� C. (86� F.). The duration of the maceration of the skins in the must and/or wine varies according to the characteristics of the grapes but it usually amounts to about two weeks. During this period, the skins are forced upward by carbon dioxide produced by yeasts during fermentation and form a compact mass known as the cap. In order to get the most out of the raw material, the cap is broken up and forced downward. And wine is pumped over the mass. The process results in the extraction from the skins of polyphenols that give the wine its color and contributes to its longevity. The polyphenols also provide aromatic substances upon which the complexity of the bouquet depends. Racking follows. The term refers to the separation of the pomace from the wine, which undergoes a second fermentation, the malolactic. In this fermentation, lactic bacteria transform aggressive malic acid into the much softer lactic acid. To give the wine limpidity, rackings are carried out and the last of them occurs, according to tradition, at the moment of the flowering of the vines, which announces the arrival of hot weather. The wine that will soon be placed on the market remains in tanks or in casks for some months, while the products that will become Riservas begin their long sojourn in wood followed by fining in the bottle. Once acquired, Chianti Classico is a wine that must be carefully preserved. The ideal setting is a cellar that is not humid and where temperatures are constant. However, the wine can be laid down in nearly any place that is not exposed to light, noise or sources of heat. It must not be forgotten that this wine is a product that continues to live a slow evolution after fermentation during which it develops further finesse. It is also necessary to place the bottle in a horizontal position so that the cork, moistened by the wine, maintains its elasticity, which is necessary to block oxygenation due to the infiltration of air. The longevity of a wine also depends on the duration of its preservation in the winery. The bigger its structure�as in the case of the Riserva�the longer the period of waiting before consumption of the wine can begin. Chianti Classico makes a fine accompaniment for the flavors of Tuscan cuisine but it can also be teamed up with a large number of dishes. In particular, red meats cooked on the grill can be matched by wines with medium bodies and limited tannins, while more elaborate meat dishes require more structured wines. The great Riservas are ideal as accompaniments for dishes of game and aged cheeses. Preserved in the bottle for months if not years, the wine needs to be oxygenated before being served; that's especially true of a Riserva. For this purpose, the bottle is opened several hours before consumption. If this is not possible, the wine can be decanted. It is poured slowly into a carafe and it quickly absorbs oxygen. The ideal serving temperature is 16-18 degrees C. (61-64� F.). If the temperature is too high, it risks suffocating the alcohol in the bouquet; if it is too low, the acidity will lose its equilibrium. No less important is the choice of the correct goblet. To exploit a Chianti Classico wine to the maximum and exalt the bouquet, a tulip shaped goblet is necessary. The rim should taper slightly inward. A young wine requires a smaller goblet, while a Riserva needs a more ample glass.. The Consortium therefore assists oil producers in their constant efforts to create a product that maintains high levels of those components that actively help in protecting our health and give the product "classic" aromas and flavors. But the work done by the Chianti Classico DOP Olive Oil Consortium is not limited to olive groves and olive presses. It extends to other spheres, promoting the Black Rooster's extra virgin olive oil through scientific and educational events around the world. As of today the Consortium has 250 members working in the Chianti Classico zone, which consists of the communities of Castellina in Chianti, Gaiole in Chianti, Greve in Chianti, Radda in Chianti and, in parts of those of Barberino Val d'Elsa, Castelnuovo Berardenga, Poggibonsi, San Casciano Val di Pesa and Tavarnelle Val di Pesa.